A former Peoples Democratic Party, PDP, New Media Director, Deji Adeyanju, has revealed what the leader of the Indigenous People of Biafra, IPOB, Nnamdi Kanu was doing for the current President Muhammadu Buhari’s government. Adeyanju, a coconvener of OurMumuDonDo alleged that the IPOB leader was working for Buhari’s second term. The activists anchored his claim on the fact that staff of Aso Rock were suddenly supporting the struggle for Biafra. Kanu, who was last seen in September 2017 when military men invaded his residence in Afaraukwu in Abia State, resurfaced in Jerusalem. The IPOB leader was seen praying in Jerusalem on Friday. 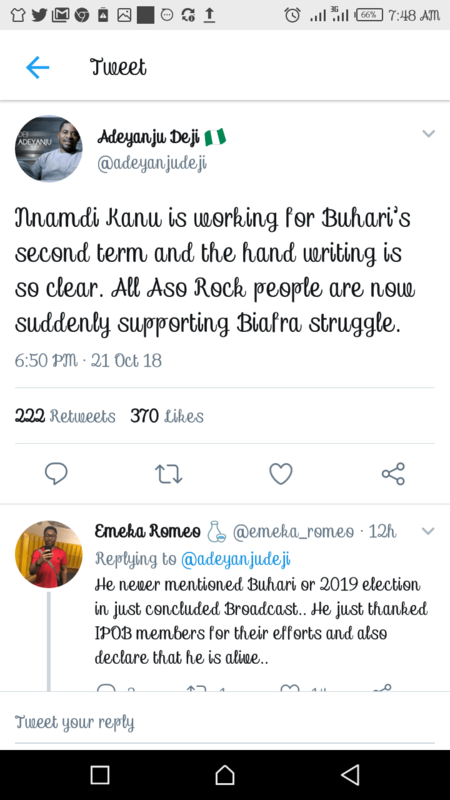 However, Adeyanju in a tweet wrote: “Nnamdi Kanu is working for Buhari’s second term and the hand writing is so clear.